I’m standing in a physical and metaphorical crossroads here. 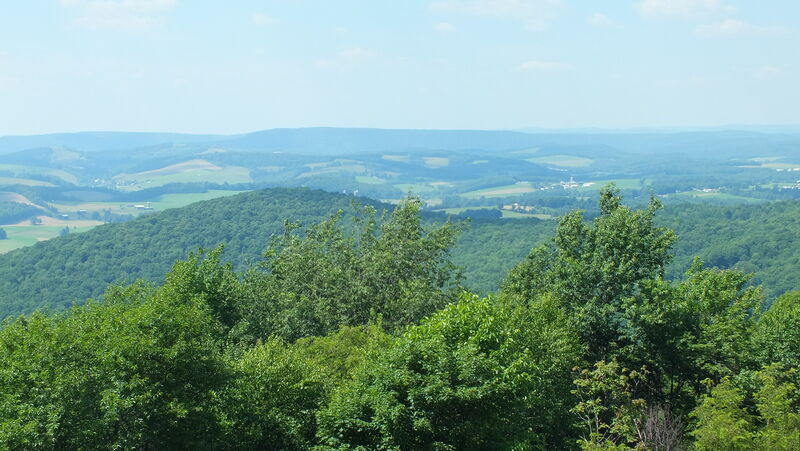 I’m in Western Maryland this week visiting my parents who live on the top of Backbone Mountain. It’s gorgeous pristine country, that is, if you can ignore the steady rumble of the coal trucks going in and out of the Mettiki strip mine just below us. Fortunately, the mine is just out of sight, below the ridge, so we can’t see it from here. But that doesn’t take away from its distraction. For five years my parents and the other nearby folks have endured the incessant banging and growling machinery, semi-weekly dynamite explosions that rattle the house, and worst of all, the maddening beep of backing-up trucks that goes from morning to night. You can never quite block it out. Sometimes I think I hear it in my sleep. Apparently the mining operation there is just about finished. It’s our understanding that Mettiki is in the final stretches of cleanup, planting grass over the remains of what had been a lush mountainside. Directly under this house, some 10,000+ feet below my feet, is the famed Marcellus Shale, a 380 million year old source of natural gas. In the past it wasn’t economical for companies to target the Marcellus, but today a new technique, hydraulic fracturing (“fracking”) has made this an economically viable source of energy. The techniques involve (1) hydraulic fracturing the shale by pumping water into the shale under pressure to create vertical fractures in the shale layer, while at the same time introducing sand into the rock to keep the fractures open once the water is removed; and (2) drilling horizontally through the layer of shale to intersect the vertical fractures in the rock. Fracking, of course has been all over the news. Some studies report that it’s safe and clean. Environmentalist and other scientists insist there are numerous problems inherent in the method. Many folks are rightfully confused. 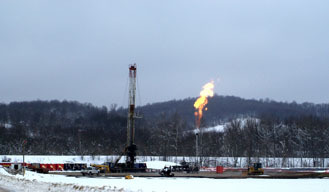 Here in Garret County, Maryland home of the Marcellus, the war over fracking is raging hotly. But really it doesn’t matter whether fracking and drilling are clean or safe for drinking water. The end result is still just one more carbon-generating energy source. Meanwhile, as the coal mine winds down and the various interest groups argue over the fracking, at the other end of the mountain another energy source has emerged. The ridge of Backbone mountain runs roughly north-south. The photo at the top of this blog is the east-facing view from the house. The coal mine is down the hill below the trees, slightly to the south. The photo to the left is what you now see if you step out onto the gravel road and walk north for about 5 minutes. This is south end of the Constellation Energy Criterion Wind Project. 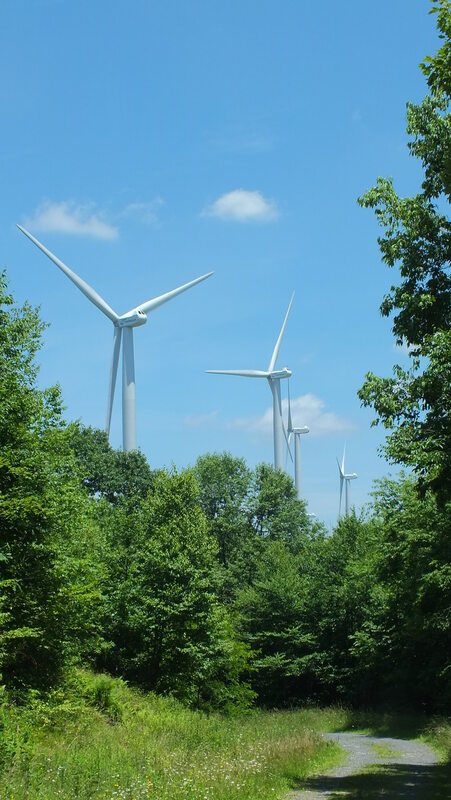 This 70 megawatt wind farm, Maryland’s first, came online last December. Its 28 turbines cover an 8-mile stretch of Backbone Mountain and generate enough to electricity to power around 23,000 homes. The turbines themselves have a bit of a low rhythmic hum to them. We can’t hear them from the house but it’s pretty clear as you approach them. The sound has been accurately described as the sound of traffic on a distant highway, the low hum of a far-off airplane, the distant sound of ocean waves rolling onto the beach, or the air being emitted through a ventilation system in your house. 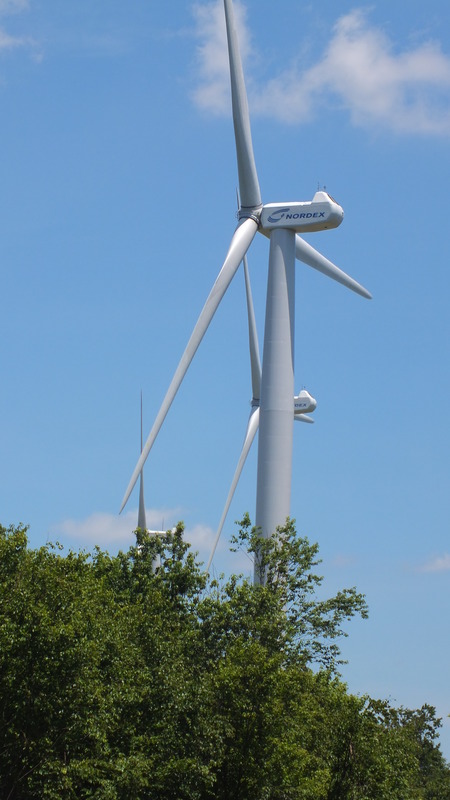 The sound varies depending on which way the turbines are facing. Sometimes they are bothersome, mostly because of their rhythmic nature. Other times you don’t hear them at all. Today when I was up there, a steady but light wind was blowing across the ridge and I couldn’t hear a single turbine. I did note that the wind was light enough that I could still hear birds. I also noticed, on a previous walk up there, that the sound of the turbines was noticeably dampened when I was in the woods. It doesn’t take much to drown them out or buffer them. In fact, the only reason anyone here on the ridge can hear them at all is because they went in before there were any setback rules in effect. The folks who own the property were allowed to put them wherever they wanted. Far from their houses meant our back yard. Now before you think I’m going to go all NIMBY on you, let me say this: I’m ok with that. Given the choice (and that’s what it comes down to here — having to choose one energy source over another), I’ll take the wind farms. Sure, lets get some setback rules into effect. Let’s find ways to make them quieter. Let’s make sure they aren’t killing bats or birds or anything else in great numbers. But, most importantly, let’s not get sidetracked with the minor issues this relatively new technology brings with it. They’ll get fixed. Give them time. All of the negative impacts of wind turbines added together don’t come anywhere near to what coal, gas and oil have done to this planet. I say, bring them on.